Dabaang! ‘Being Human’ – Salman Khan’s ‘Charity’ – To Make Film – Katrina’s younger sister to DEBUT! Are Hud Dabaang Dabaang Dabaang! Salman Khan & his charity Being Human is to launch a film starring Katrina Kaif’s younger sister who will debut with a lead role. ‘Being Human’ is a charity founded by Bollywood star Salman Khan, above is a photo of Salman in his charities well-known logo, which works to help the unfortunate children by providing them with healthcare and education. 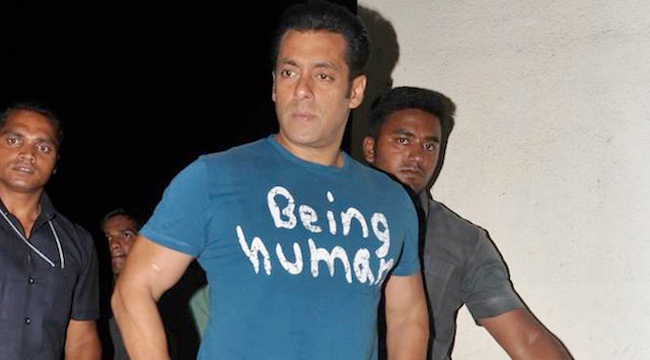 The launch of Being Human’s first flagship store in Mumbai, happened on January 17, 2013 and that’s where this snap of Salman’s Being Human ‘Blue T’ was taken. And Finally – his stand on not accepting awards. All the same, Salman Khan has been working hard on every level to promote his charity and latest films, and, a spot has been booked for Eid (a celebratory Islamic festival) which is when a film starring Salman will be screened in Cinemas, called Sher Khan. The plot of Sher Khan is still unknown although Sohail Khan, brother of Salman will be producing it and as you may know Arbaaz another of Salman Khan’s brother produced Dabaang and Dabaang2, which were both big hitters in the world of Bollywood Cinema, the brothers will surely be alive to the notion that Sher Khan may be another film to do well. The latest news on Salman’s charity trust is that they and their ambassador have offered some much needed help to the drought-hit Marathwada region of Maharashtra. The Being Human foundation will provide 2,500 water tankers with a storage capacity of 2,000 litres each to the drought affected districts from the 6th to the 31st of May 2013. The latest news for the charity Being Human is that they recently had a store launch in the Fortis Hospital, Gurgaon, Fortis has many hospitals across the country and the Being Human Foundation is helping particularly in the area of congenital heart defects. Salman Khan said of the partnership: “From time to time, Being Human is approached by cases of children with heart conditions. The solution is very specialized and not financially affordable for a number of people. We needed to partner with a reputed institution that could offer a sustained solution, preferably at a pan-India level. In Fortis, we have found such a partner.” The partnership’s campaign has been called The Little Hearts, and they aim to cure 500 children, from heart defects. The actor aged 47, also promoted being charitable by saying “do charity and do it directly” he went on to say “everybody does charity, but not everybody likes to talk about it. Some may do it for personal benefits, to stay in the limelight or others might do it genuinely. According to me, you may do charity for any reason, but do it anyways. No matter what the intention is”. Salman went further to clarify his view on direct charity he said: “Rather than giving money at a place where you don’t know how it will be utilised, it is better to make direct charity like funding a child’s education. At least you can see the results yourself”. Being Human will certainly be wanting to make an impression in the field of work that Salman is in, Bollywood Cinema, and yet here’s the surprise, the Being Human foundation’s film will be a Hollywood flick! The cast is cool with Speedy Singh’s Vinay Virmani as a lead, alongside Kunal Nayyar who is from The Big Bang Theory television show and in Harold and Kumar, with a rumoured link to Isabella Kaif who is said to be starring in the film entitled Dr Cabbie. The story is an interesting one, of an unemployed Indian doctor who immigrates to Canada and drives a cab for his living, although things take a turn, in a twist, when he is made into a local hero after turning his taxi into a mobile clinic. The film is to go into production in the next few weeks and is going to be distributed by Eros and the project is said to be a $25million project. “If the branding strategy is well laid out, Being Human and brand Salman definitely have the potential of outliving Salman Khan, the actor”, Managing Director of brand consultancy Interbrand India. Keep an eye out for Dr Cabbie! Also do let me know what you think about Salman’s “Being Human” charity trust. Hello, Vijay, thanks for this award, glad to be receiving it and happy blogging to everyone! Is there any links you require to whose blog I also like. Yours is one of them!